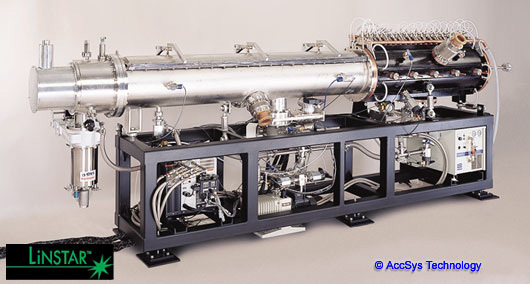 Linstar manufacturing information | AccSys Technology, Inc.
Several AccSys LiNSTAR™ systems are currently in use as injector linacs at a number of proton synchrotron facilities for cancer therapy and physics research. Stable operation has been shown for a wide range of beam currents, pulse widths and repetition rates. One recently delivered system features beam pulses available on demand at repetition rates as low as 0.1 Hz. Standard LiNSTAR™ systems are available at output beam energies from 2 to 7 MeV. Higher injection energies are available as custom linac systems. LiNSTAR™ system (rf power & injector electronics not shown).